7:05am A false alarm was received from the 900 block of Hopley Ave.
8:04am A report of a stolen auto was received and was unfounded. 8:10am A motorist was given a verbal warning in the area of Sandusky and Marion Rd. 11:06am A report of a burglary in the 200 block of W. Charles St. was investigated. 11:22am A false alarm was received from the 200 block of Franklin St.
11:52am An accident report was taken in the area of Poplar and Warren Sts. 12:20pm A disturbance in the 1700 block of Marion Rd. was investigated. 12:40pm Officers looked for a reported suspicious male in the Ridge Ave. area. The male was not located. 12:56pm A disturbance in the 200 block of W. Southern Ave. was investigated. 1:27pm Officers checked the welfare of an elderly subject in the area of Southern Lights shopping center. 2:19pm A subject was assisted in entering his locked vehicle in the 300 block of S. Sandusky Ave.
3:19pm A report of a young child riding his bike on the roadway on Marion Road was investigated. 3:37pm An officer spoke with a mother and young daughter about stealing. 3:57pm A domestic disturbance in the 500 block of Virginia Avenue was investigated. 4:18pm A verbal traffic warning was issued in the area of Spring and Liberty Street. 4:58pm Officers assisted a motorist locked out of her vehicle at UDF. 6:34pm A resident in the 400 block of W. Charles Street reported being assaulted by someone she knows. 6:35pm A resident in the 500 block of W. Charles Street reported a package stolen from his porch. 6:52pm A worker at Bucyrus Little Theater reported a younger child shooting off a cap gun in the lobby. 7:00pm A report of a vehicle squealing tires and driving erratically while leaving Kroger was received. 8:34pm A suspicious person at Indian Creek Apartments was investigated. 9:10pm Officers assisted a motorist locked out of his vehicle at the Bucyrus United Methodist Church. 9:15pm A report of an erratic driver on S. Sandusky Avenue was investigated. No traffic violations were witnessed by officers in the area. 9:25pm A domestic disturbance in the area of Mansfield and Highland Avenue was investigated. 9:42pm A false alarm in the 500 block of Jones St. was investigated. 9:53pm A report of possibly intoxicated driver at Bucyrus Plaza was investigated. 10:17pm A report of 2 suspicious juveniles in the area of S. Lane St. at Woodlawn Ave. was investigated. 10:28pm A false alarm in the 1100 block of Isaac-Beal Rd. was investigated. 11:03pm Officers mediated a domestic issue in the area of E. Mary St. and N. Walnut St.
11:27pm A report of a possibly intoxicated male driving a riding mower in the 100 block of S. Sandusky Ave. was investigated. 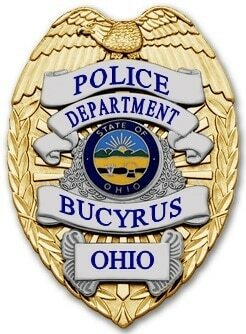 11:39pm A report of a male yelling at Bucyrus Plaza was investigated. It was found to be a resident’s radio. 11:47pm A report of loud music in the 1100 block of Teddy Ave. was investigated. 1:00am A verbal traffic warning was given in the area of W. Southern Ave. and S. Sandusky Ave.
1:02am A false alarm was investigated in the 1100 block of Isaac-Beal Rd. 1:53am Officers on patrol investigated a parking issue in the 400 block of Heritage Circle. 5:42am An open line 9-1-1 call in the 200 block of E. Beal Ave. was investigated. 6:55am A report of an injured rabbit in the 500 block of S. Spring St. was received. The rabbit hopped away before officer’s arrival. 7:15am A report of a breaking and entering in the 1200 block of Willard St. was investigated. 12:12pm A report of a domestic dispute in the 300 block of S. Spring St. was unfounded. 12:12pm Officers took an injury accident report at Southern and East Sts. 12:38pm Officers assisted a subject in entering his locked vehicle in the 400 block of Osman St.
12:58pm A business in the 100 block of W. Warren St. reported copper stolen from their air conditioning unit. 2:11pm An employee at McDonald’s reported being scammed out of $20.00. 3:17pm Officers assisted EMS personnel at Walmart. 3:32pm Brooke Bayless, 21, was arrested on a Crawford County warrant. She was transported to the Crawford County Justice Center to be held for court. 3:40pm A parking complaint in the 200 block of E. Mansfield Street was investigated. 3:52pm Officers spoke with railroad personnel regarding barriers blocking driveways in the area of W. Mansfield and Sears Street. 4:12pm A report of suspicious activity in the parking lot of Circle K was investigated. 4:36pm A report of suspicious activity outside Kroger was investigated. 4:39pm Three income tax summons were served at the Police Department. 5:20pm Officers checked the welfare of a resident in the 1300 block of Whetstone Street. 5:51pm A disturbance at Indian Creek Apartments was investigated. 6:35pm A false alarm at the Bucyrus City Garage was investigated. 6:59pm Officers assisted a motorist locked out of her vehicle in the 600 block of Virginia Avenue. 7:02pm Officers attempted to serve a warrant in the 500 block of Rogers Street. 7:46pm A report of dogs running loose in the area of Southern and Prospect Street was investigated. 8:01pm A verbal traffic warning was issued in the 1300 block of Woodlawn Avenue. 8:59pm Officers checked the welfare of a resident in the 100 block of William Street. 9:20pm A report of a suspicious vehicle in a driveway in the 200 block of W. Mary Street was investigated. 9:26pm A false alarm at Dostal & Kirk was investigated. 9:56pm A verbal traffic warning was issued in the area of Warren and Catherine Street. 10:21pm A report of a female walking in the roadway in the area of Southern and Kaler Avenue was investigated. 11:33pm Officers on patrol broke up a fight in the area of Dudley St. and N. Sandusky Ave. Neither party involved wanted to make a report. 1:02am A false alarm in the 1100 block of Isaac-Beal Rd. was investigated. 1:25am Levi Yates, 27, was arrested for Disorderly Conduct. He was issued with a misdemeanor citation and taken to the Crawford County Justice Center to be held for an appearance in court. 1:45am A resident in the area of Milo St. and Earl St. reported seeing shadows in the area. Officers checked and did not locate anyone. 2:01am An employee of Bucyrus Community Hospital reported her vehicle broken into while she was working. 2:21am A verbal traffic warning was given in the 400 block of N. Sandusky Ave.
2:47am A verbal traffic warning was given in the 100 block of S. Spring St.
4:54am A report of a suspicious person in the 1300 block of N. Sandusky Ave. was investigated. 9:50am A parking complaint was investigated in the 1100 block of Rogers St.
10:22am A subject came on station to discuss a child custody issue. 11:05am A Marion Rd. resident reported his bicycle stolen from the 1500 block of Tiffin St.
11:37am A parking complaint in the 700 block of W. Mansfield St. was investigated. 11:38am Officers took a private property accident report in the intersection of Sandusky and Warren. 12:06pm A domestic problem was investigated in the 400 block of W. Rensselaer St.
12:45pm Officers investigated a report of fowl living in the 500 block of E. Mansfield St. The fowl was being removed as officers were there. 12:55pm A reported theft was investigated in the 500 block of W. Charles St.
1:18pm A hang-up 911 from the 300 block of W. Mansfield St. was investigated. 1:38pm Officers mediated a domestic issue in the 200 block of Whetstone St.
1:44pm A report of a child in the roadway in the 200 block of W. Charles St. was investigated. 2:57pm A report of juveniles with airsoft guns in the 1200 block of E. Mansfield St. was investigated. They were found to have toy cap guns. 3:39pm Officers attempted to locate a subject wanted for Domestic Violence in the 400 block of E. Rensselaer St.
4:00pm Officers responded to an accident in the area of Schaber Ave. and Monnett St.
4:03pm Officers investigated a disturbance in the 800 block of S. Walnut St.
4:38pm Officers conducted a civil stand by in the 900 block of Elm St.
4:40pm A report of possible drug activity in the 200 block of Woodlawn Ave. was investigated. 4:46pm Officers conducted a welfare check in the 800 block of S. Sandusky Ave.
4:55pm A found bicycle was returned to the owner on station. 5:49pm A false alarm in the 1100 block of Isaac-Beal Rd. was investigated. 6:17pm Officers assisted a motorist in the 100 block of W. Mansfield St.
6:26pm Lindsey C. Atwood, 29, was arrested for possessing of drug abuse instruments and possession of heroin. She was taken to the Crawford County Justice Center to be held for a court appearance. 6:26pm Eddie Awbrey, 46, was possession of drugs and drug paraphernalia. He was taken to the Crawford County Justice Center to be held for a court appearance. 7:16pm Officers talked to a female on station about a possible fraud. 7:36pm A burglary in the 200 block of Schaber Ave. is under investigation. 7:54pm Officers conducted a welfare check in the 1700 block of E. Mansfield St.
8:16pm A report of motorist peeling tires in the area of E. Mansfield St. and Whetstone St. was investigated. 9:05pm A domestic issue in the 400 block of E. Rensselaer St. was investigated. 9:27pm A report of a possible scam is under investigation. 9:27pm A parking issue in the 200 block of N. Walnut St. was investigated. 9:51pm Officers picked up a credit card in the 1100 block of Lincoln Highway was investigated. 10:11pm Craig Boudinot , 42, was arrested on a warrant out of Crawford County. He was taken to the Crawford County Justice Center to be held. 10:14pm David Charlton, 37, was arrested for possession of drugs, an active warrant out of Crawford County, and domestic violence. He was taken to the Crawford County Justice Center to be held. 11:00pm Officers conducted a welfare check in the 300 block of E. Rensselaer St.
11:50pm A verbal traffic warning was given in the 200 block of W. Charles St.
11:58pm A report of loud music at Bucyrus Plaza was investigated. 12:06am Angela Cary, 31, was arrested for operating a vehicle under the influence of alcohol. She was issued with a date to appear in court and taken to the Crawford County Justice Center to be held until sober. 2:59am Officers on patrol checked on an unoccupied vehicle parked at Aumiller Park. 3:22am A report of people yelling at a residence in the 1000 block of Maple St. was investigated. 3:40am A report of a vehicle knocking over road barricades at W. Galen and N. Poplar St. was investigated. 4:38am A report of a male sitting in the rain on S. East St. was investigated. Officers checked the area and did not locate anyone. 6:41am Officers conducted a welfare check in the 300 block of S. Walnut St.
7:32am Officers assisted Life Support Team in the Bucyrus Plaza area. 9:34am A motorist was issued a traffic citation for fictitious tags in the 400 block of N. Sandusky Ave.
10:20am Officers investigated a report of a scam in the 800 block of S. Walnut St.
11:16am Officers assisted a motorist with a vehicle lockout in the 400 block S. Sandusky Ave.
11:25am A report of dogs barking in the 300 block of S. Spring St. was investigated. 11:31am A report of a disturbance in the 500 block of S. Walnut St. was investigated. 12:13pm A false alarm was received in the 1000 block of Martha Ave.
12:17pm A motorist was given a verbal warning in the 900 block of Tiffin St.
12:27pm Officers stood by for property exchange in the Bucyrus Plaza area. 12:47pm A false alarm at the County Fairgrounds was investigated. 1:19pm A report of a female passed out in the yard in the 200 block of Iron St. was investigated. 2:30pm Officers investigated a report of an intoxicated male in the 500 block of N. Sandusky Ave.
2:46pm A report of people shooting BB guns in the 500 block of Union Street was investigated. 2:49pm A report of a suspicious person on the railroad tracks off Plum Street was investigated. 3:24pm Two juveniles were warned about trespassing on the railroad tracks off Blicke Street. 3:58pm Officers assisted a motorist locked out of her vehicle at InstaClean Car Wash.
4:01pm Three people were warned about trespassing at Circle K.
4:09pm Ashley Clemons, 27, was arrested on charges of Possession of Marijuana and Possession of Drug Paraphernalia. She was issued a minor misdemeanor citation for each and released. 7:00pm A verbal traffic warning was issued in the area of Whetstone and Woodlawn Avenue. 7:31pm A false alarm in the 1600 block of Marion Road was investigated. 7:56pm A disturbance in the 1700 block of Marion Road was investigated. 9:25pm A false alarm at Transco was investigated. 9:44pm A false alarm in the 1100 block of Reid St. was investigated. 10:07pm A verbal traffic warning was given in the area of N. Sandusky Ave. and Mary St.
10:15pm A verbal traffic warning was given in the area of Crossroads Blvd. 10:49pm Officers responded to a report of a vehicle on the RR tracks at N. Poplar St. and W. Galen St.
10:49pm Tiffany Moss, 23, was arrested for operating a vehicle under the influence of alcohol. She was issued with a date to appear in court and released to a sober party. 12:03am Stacy J. Higginbotham, 31, was arrested for Domestic Violence. She was taken to the Crawford County Justice Center to await a court appearance. 12:18am A false alarm in the 1000 block of Marion Rd. was investigated. 12:30am A report of a female yelling in the 900 block of Hull Ave. was investigated. 12:51am A report of a dog bite at Bucyrus Community Hospital was investigated. 2:07am A verbal traffic warning was given in the area of Hill St. and Plants Way. 2:20am A verbal traffic warning was given in the 100 block of Hill St.
2:25am Alec Hetzel, 20, was arrested for underage consumption of alcohol. He was issued a criminal summons and released with a pending court appearance. 2:31am A report of 2 possibly intoxicated teenagers walking in the 300 block of S. Lane St. was investigated. 2:35am A Norwalk woman is being investigated for possession of heroin after officers were called to the 900 block of Earl St.
3:59am A false alarm in the 400 block of N. Sandusky Ave. was investigated. 10:21am A resident in the 900 block of Laura Avenue reported her personal information used fraudulently to open a phone account. 10:30am Officers investigated a report of a vehicle driving around the top of Outhwaite Reservoir. 11:08am A report of a disturbance in the 300 block of S. Lane St. was investigated. 1:13pm A report of a theft in the 1600 block of N. Sandusky turned out to be unfounded. 1:22pm A report over child custody in the 800 block of E. Rensselaer St. was investigated. 1:43pm Officers assisted a motorist with a vehicle lock out in the 1700 block of Marion Rd. 2:52pm A parking complaint was investigated in the 700 block of S. East St.
3:19pm A traffic complaint was investigated in the area of Milo St.
3:31pm A false alarm was investigated at Transco. 3:33pm A W. Southern Av. resident reported receiving nuisance telephone calls. 3:43pm Jessica Garverick, 27, and Jonathon Dible, 29, were both arrested and charged with Drug Paraphernalia. They were each issued a summons to appear in court and released. 3:50pm A Woodlawn Av. resident reported a wicker chair and cushions stolen. 5:11pm An injury accident was investigated in the area of W. Galen St. and Spring St.
6:39pm A welfare check was requested in the 700 block of Gay St. The resident was not located. 7:10pm Officers picked up two syringes in the 1800 block of E. Mansfield St.
9:22pm A 16 year old Bucyrus boy was arrested on charges of Unauthorized Use of a Motor Vehicle, Operating Without a License, Failure to Comply and Reckless Operation of a Vehicle. He was transported to Marion Juvenile Detention to await a hearing in juvenile court. 9:45pm A report of a suspicious vehicle at Kroger was investigated. The vehicle was gone before officers arrived. 9:48pm A report of loud music in the 900 block of Elm Street was received. 10:02pm A resident in the 300 block of N. Sandusky Avenue reported a window broken out of his vehicle. 11:10pm Officers assisted a motorist locked out of her vehicle in the 1400 block of Hopley Avenue. 11:13pm An employee of Walmart reported that someone had shoplifted a couple televisions. 11:15pm A verbal warning for loud music was issued in the 900 block of Elm Street. 12:54am A resident in the 700 block of Ann Street reported someone attempting to get in her window. 1:01am A domestic disturbance in the 1200 block of Reid Street was investigated. 5:48am A report of a barking dog in the 300 block of S. Spring Street was investigated. 6:20am A resident in the 200 block of Bland Avenue reported her vehicle damaged overnight when someone burned her seats with a smoke bomb.